On a packed Wednesday edition of the Hail Varsity Radio Show, Chris Schmidt caught up with the high school coach of recent Nebraska signee, linebacker David Alston. 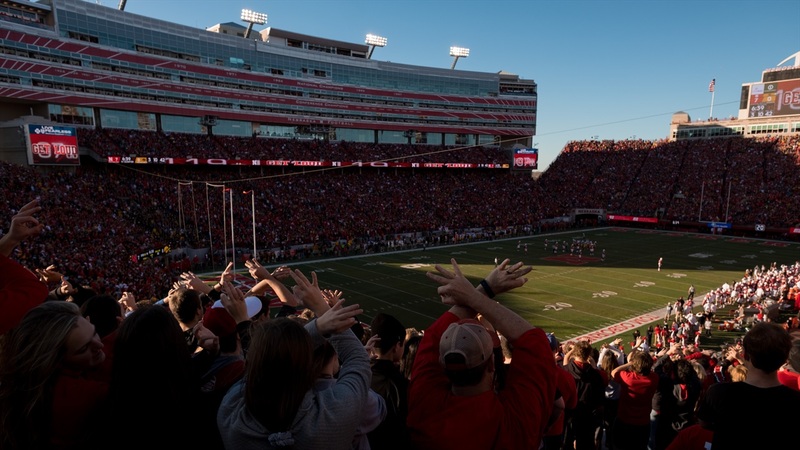 Andy Hill, the head coach at Woodbury High School in Minnesota, talked about the top recruit in the state and his decision to sign with the Huskers despite coaching turnover. CS: Tell me a little bit about David and what he did for you at Woodbury? AH: "David’s just an outstanding young man. He’s very mature and a little bit reserved and he likes to think before he speaks. He’s not going to do anything dumb when he gets on campus. I’ve always enjoyed that I can trust him. He’s got integrity on and off the field. "On the field he’s a freak. I remember he played defensive end for us most of the time so teams could choose to avoid him and most teams wanted to. With that, he still had 26 career tackles for loss, 13.5 sacks, was our conference defensive player of the year. Led our conference in interceptions this year as a defensive end so think about that." CS: How does that happen? AH: "It goes with intelligence. He’s really a smart kid and he played the position well. He would read and he would know that if, in the scheme he starts to rush the passer and nobody touches him, that’s not supposed to happen so then he would survey what’s going on around him. Three of his interceptions were on screen passes, one of which he returned for a touchdown against a rival. His fourth was when he was an outside linebacker for us, we were manned up and it was the end of the half, they did a Hail Mary and he did a little toe-tap interception in the end zone. "He knows how to play the position where it’s not just, ‘I’m shot out of a cannon every single play,’ he’s going to make his read and then respond appropriately." CS: When you look at David Alston as a defensive end and a linebacker at the next level, where do you see his skill set thriving at? What can you see him doing impact-wise for the Nebraska defense? AH: "I think he provides some versatility. They’ll make him what they want him to be. He’s long and lean but he’s really physical and explosive, so with that they can make him be a 245-pound outside linebacker at 6-foot-5 or they can make him a 275-pound rush end. It’s really how they want to use him. "The nice thing is David is really disciplined. Whether it’s school or football or in the community. He’ll eat what he’s supposed to eat, he won’t miss a workout, he’ll study the film, he’ll get in with his position coach and really develop into what they want him to be, whether that’s an outside linebacker or more of rush guy or a hybrid between the two. I think his potential is outstanding. "He’s going to come into college with about a year-and-a-half to two years of college credit between the college courses he’s taken here and the AP credits transferring in. I know he’s planning to be there for five years to finish his undergraduate degree and continue to pursue a graduate degree. I know he’d love to play in the NFL so he’s that dedicated kid that’s got that mindset. "I’m eager to kind of see. I know he’s not really limited as far as what they want to do with him on the defensive side of the ball. They just have to make that decision and he’ll pursue it full speed ahead." CS: Is there a lean one way or the other? AH: "I don’t think he cares. His biggest strength for us in high school was rushing the passer but high school football is all about stopping the run and we could set him on the weak side and then have our overhang outside linebacker be on the strong side and you either had to run against the numbers and run at David or you had to run against an extra defender on the other side. Our defense played really well this year and I think he was a big part of it because he kind of cut the field in half." CS: What connected with Alston and Nebraska. What made it the right place for him even with a coaching change? AH: "We started this process over a year ago. Like I said, he thinks before he speaks and he’s going to put a lot of thought and research and feel in and really for him it just kind of came down to it felt like home. But rather than that being knee jerk emotional reaction like it is for a lot of 18-year-olds, he researched the alumni network and looked at the programs to study throughout the University of Nebraska and he really felt like it was the best fit for him." CS: What type of impact has the coach Scott Frost and the new staff made with him? "My guess is Frost and those guys quickly made that evaluation and thought, ‘it’s the No. 1 kid in Minnesota, big, tall, explosive kid that we can kind of make for what we want. He’s the perfect fit for what we do.’ I think they communicated that to him because he’s been excited ever since talking with Coach Frost and then when Coach [Jovan] Dewitt came up and visited." CS: With the early signing period now, how did David take to the process of having to pull the trigger early? AH: "I think he was okay with it. I think once he made his commitment, he would have been happy to sign back in October when he decided. He’s different than most kids. He puts in a lot of thought, a lot of research and then when he makes that decision, it’s one that’s made with integrity and he wants to stay with it. I think form the moment he said ‘I want to be a Cornhusker,’ he could have signed."